‘The Adventures of an Acupuncturer – A Clinical Autobiography of Qigong Acupuncture’. A free download of this book is available by clicking the link in the brown box on the front page of this website. This work is also called Medical Qigong, Chi Kung Healing, Energy Treatment and other such names. I use the term Qigong Acupuncture because it simply combines my two specialities, given over three decades in clinical practice. The short history of how this came about is that having practiced Classical Acupuncture since 1977 and Qigong since 1983, visited and trained in China twice, written four books on the topic, and met dozens of other practioners through the National Qigong Association USA… I had slowly incorporated Qigong into my clinical treatments over the years, combining it with using traditional Acupuncture needles. When I left Boulder, in Colorado USA, in 2013 I was using Qigong 50% of the time. When I moved to Liverpool I found out that I could not use Acupuncture – defined as ‘skin piercing techniques’ – until I had been Certified and Registered by the City of Liverpool, and this took 9 months to get set up. So I began to just use Qigong – my own energy – exclusively. Otherwise everything else was exactly the same – same intake, pulse reading, diagnosis, treatment progression and results – people’s energy functioning more correctly, giving them an improved state of health. And a big advantage is that not only do people never feel the discomfort of a needle, but they are able to have a much clearer sense of their own energy moving. So, as of this time I am focusing solely on Qigong – without needles. In this work the state of Health is defined as being when the energy system has five characteristics, which can be ‘read’ on pulses of the wrist by an experienced practitioner. 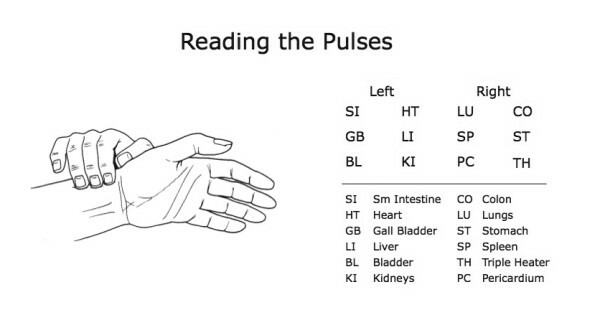 Feeling and reading the 12 pulses, six on each wrist, is the primary diagnostic technique of Acupuncture and Chinese Medicine. The 12 pulses relate to the 12 organs/officials – Heart, Small Intestine, Bladder, Kidneys, Pericardium, Triple Heater, Gall Bladder, Liver, Lungs, Large Intestine, Stomach and Spleen – and give a comprehensive holographic picture of the quality and condition of a person’s energy, and therefore their state of being. When a person’s pulses has these aspects their energy system has correct function, and gives them the best option. You can come and find out for yourself in a Free ‘Initial Consultation’, which is available by appointment. 1. To find out why you want treatment; anything that causes you concern; anything you want to have checked out; issues you would like improvement in. 2. To ‘Read the Pulses’. 3. This information then provides the basis for an Opinion, and Recommendation of what course of treatment is indicated and possible. 4. And finally to answer any questions that you may have. Also, we get to meet each other. Qigong Acupuncture is very personal. After all, choosing a practitioner is a very significant decision, similar to choosing a Doctor or personal guide. For some people there may be an instant recognition that a practitioner is right for them; other people may need more information. For somebody to want to get treatment from me they have to feel that I am the right practitioner for them. They will only know this if we meet in person. UK 44 (0)7913208959 or email via the contact link in the menu at the top of the page.